Truckee's Reed Loper watches his shot at Old Greenwood Golf Club on Tuesday, June 12. Loper finished second in the 12-13 age group, carding a 50 over nine holes of play. 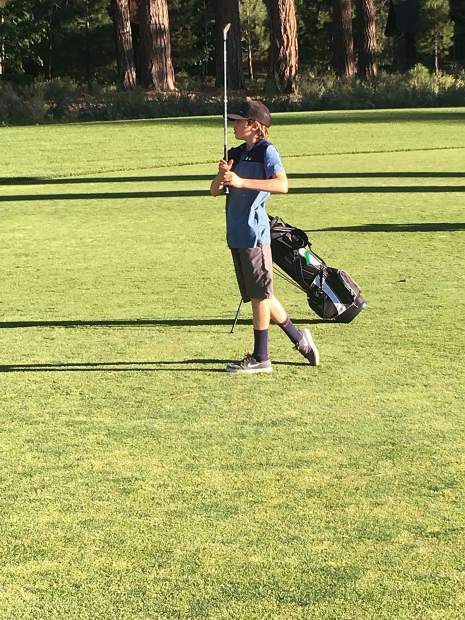 The first event of the Truckee Tahoe Junior Golf Tour season was held June 12 at Old Greenwood Golf Club under fantastic conditions. The fast greens combined with tough pin positions made for a challenging day of golf for the field of 49 juniors. Allison Mortimeyer tied for first with veteran Abbey McCormick in the girls’ 10-and-under division. Both shot a 64 in the nine-hole tournament. McCormick charged late with a birdie on the par-3 seventh hole, but Mortimeyer took home the medal after winning a scorecard playoff with a par 4 on the ninth hole. Sisters Madeline and Julia Harper took third and fourth place. Hunter Smith and Cooper Shaffer took first and second in the boys’ 8 to 9-year-old age group. Aidan Sweeney led the 10 to 11 boys with a 45. Newcomer Shane Speck took second place with a 61. Grayson Perryman of Tahoe finished third with Ryland Carpenter coming in fourth. Theresa Shaw led the competitive 11 to 14 girls’ division with a 47. Ella Williams finished second with a 50 followed by Ryan Flynn with a 51. Shannon Hugar, of Incline Village, finished fourth with a 56, Kenzie McCormick and Maris Durant-Bender came in 5th and 6th. Trevor Buti, of Auburn, made a 5-foot putt on the ninth hole to win by one stroke with a 49 in the boys’ 12 to 13 age group. Reed Loper, of Truckee, was second with a 50. Ethan Raymore, playing out of Tahoe Donner, finished another shot back at 51. Casey Slusher earned two Cup Points with his fourth-place round of 52. Kadin Harris, from Tahoe City Golf Club, took fifth at 56. Haley McCormick and Corina Shaw were tied teeing off on the ninth hole in the girls’ 14 to 17 age group. McCormick would edge out Shaw with a 5 on the final hole to finish at 49. The boys’ 14 to 17 age group was the largest division of the day with 17 competitors and the only competing over 18-holes. Still in top form after his second-place finish in the Class 2A State High School Championships, Murphy Scott started the season with a two-stroke victory, shooting an 80. Jack Brown, of Truckee High School golf team, finished second with another solid round at 82. Matthew Volkman came in third with an 85. Connor Hipsley and Ethan Flynn rounded out the top 5 with 86s. Owen Slusher and Gabe Smith also shot under 90 with rounds of 87 and 88, respectively. Six years ago when the tour first started only one player in this age group broke 90. To see complete results go to http://www.ttjgt.com and look under the Scoreboard tab. The next tournament will be Tuesday, June 26, at Tahoe City Golf Club.